Are you an ambitious perfectionist who doesn’t want to settle for a job out of convenience but rather wants a job that suits your interests and goals perfectly? If you are, then you most probably have scoured the Web and newspapers for companies that have the position that you are looking for. And to your chagrin, you found out that at the present moment, the position you want is not available. Well, worry not about waiting for the position to become vacant; rather, you may apply for the said position sans job posting/advertisement. You can do this by submitting a well-crafted and appealing letter of introduction together with your update resume or curriculum vitae. 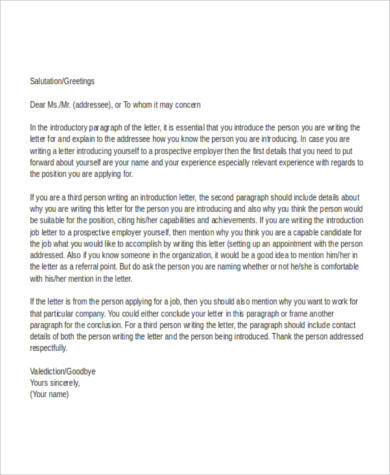 Here at sampletemplates.com, we provide you with easily downloadable introduction Sample Letters that may serve as your reference. Freely scroll down below and download the ones that you find useful. In content, however, these two letters are more or less similar. Both contain a brief narrative describing the traits, characteristics, skills, and achievements of the applicant in relation to the position applied for. Clearly, there is a fine demarcation line between the two and most people will fail to take this into consideration upon crafting their letters. Are you finally looking for ways to accept a job offer? Then you might want to check out our collection of Sample Job Offer Acceptance Letters. Simply click on the link provided. 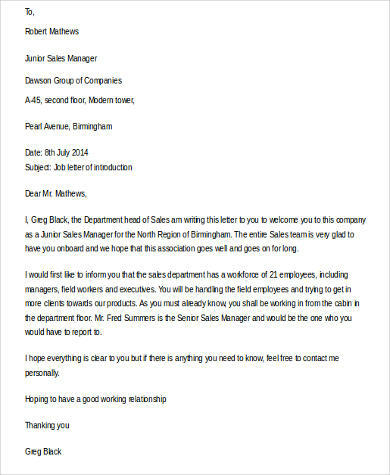 Before you scribble down a compelling letter of introduction, first, you must do some background research on the company. Surely, you have done a bit of research already since you have decided that a specific position in this company is the perfect match for you. There are, however, some important points you need to do some further research on. You need to investigate the personal achievements, skill sets, and other pertinent information of the employees presently employed and that specific company. Make your intentions precise and deliberate. Nothing is more appealing to a hiring manager’s eye than the aura of confidence exuded by a potential job candidate. Even though there is no opening for the job you are looking for, you might be able to convince the company that your presence in their team will drive their company to greater heights. After you have done your research, you need to tailor your self-description in such a way that it fits the requirements you perceive that the company is looking for. Sell yourself by emphasizing your accomplishments. It could be your academic achievements if you are a fresh graduate. Or if not, you can extrapolate your achievements in your previous company by explaining in detail how you have added value to the previous company. Now that you know the drill, draft your letter of introduction now. 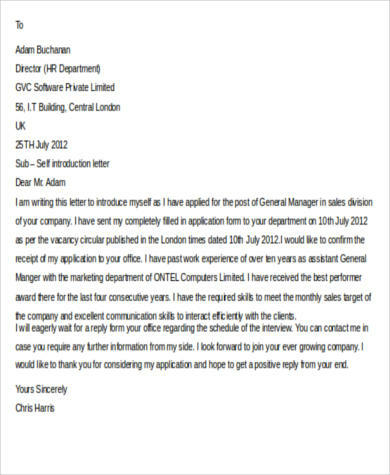 For future letter writing needs, you may also find our Sample Business Introduction Letters useful.